If Nik Wallenda Falls into the Chicago River, Could He Survive? Nik Wallenda will walk across the Chicago River on a tightrope from the west Marina Tower on Sunday. RIVER NORTH — All right, admit it, you're wondering: Would Nik Wallenda survive a fall into the Chicago River on his high-wire act set for Sunday? 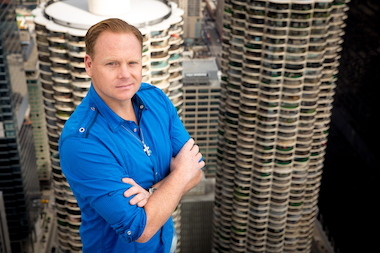 Without a tether or a net, Wallenda plans to walk across a tightrope 50 stories high — from the top of Marina City's West Tower to the top of the Leo Burnett Building on the other side of the river. When crossing the water, he'll be more than 600 feet off the ground. The 35-year-old Wallenda is the seventh generation of high-wire "Flying Wallenda" acts, and no one in his family has ever done such a high stroll between skyscrapers or at such an uphill pitch. The Leo Burnett Building is taller than Marina City, so he'll need to walk up at a 15-degree angle. Daredevil Nik Wallenda walks 454 feet across the Chicago River on a tightrope from the west Marina Tower (r.) to the Leo Burnett Building Sunday. Then he'll cross from one Marina Tower to the other — blindfolded — that is, if he survives the first walk. 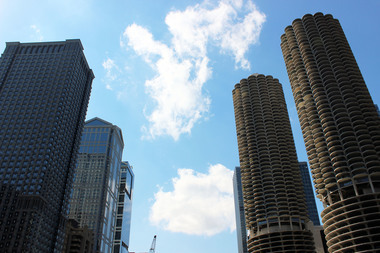 He'll start at an elevation of 588 feet from the Marina City West Tower at 300 N. State St. to the roof of the Leo Burnett Building at 35 W. Wacker Drive, which has an elevation of 671 feet. He'll then take an elevator down, cross the river on the ground, go back up to the Marina City roof and walk between the two towers ... blindfolded. So, some quick questions on "Skyscraper Live With Nik Wallenda," set for 6 p.m. Sunday on the Discovery Channel. 1) If he fell from the wire while over the Chicago River, could he survive? "It's highly unlikely," said Dr. David Zich, a former emergency room physician now in private practice here in Chicago. From an estimated height of 600 feet, Zich added, he'd spend four or five seconds in the air and "would hit the ground at 70 to 120 miles an hour. So if you hit cement, there's no question you're going to die." If he hit the water, depending on how much presence of mind he had to spread out, add wind resistance and then curl into a form to break the surface, Zich said, "It still would be highly unusual that you would survive." Zich said cliff divers routinely jump from 125 feet. "But we're talking five times the height cliff divers do," he said. "At that height and that speed, there is significant impact and energy that is transmitted to all of the organs, to the heart and the liver and the spleen, and it just is not compatible with life. ... The chance of him surviving, even hitting the water, is awfully small." Fifty stories is more than twice the height of the deck of the Golden Gate Bridge, the U.S. bridge that has seen the most suicides, with more than 1,500 since its construction in 1937. It's estimated Golden Gate jumpers fall four seconds before hitting the water at 75 miles an hour, and that 95 percent die on impact, with others drowning or dying from hypothermia in the chilly bay waters. Although no figures are certain, it's said fewer than 50 people have survived that fall. Surviving falls from great heights almost always involve something breaking the fall on the way down or at the bottom. Zich also discounted the idea that, if the water is choppy or wavy, it reduces surface tension and eases entry. "That's not really true," he said. "The only way to do that is by adding a chemical detergent. ... From a physical standpoint, you really do not have a significant difference in the water tension." He said waves or water sprays are added on the surface for divers, mainly to aid in depth perception, not to reduce water tension. 2) So, has anything changed to make him wear a harness? No. According to Discovery Channel spokeswoman Jackie Lamaj, "Nik will not be walking with a tether or net." 3) How far are the two walks? Some 454 feet across the river, a mere 94 feet from one Marina Tower to the other — but, again, blindfolded. 4) Will he walk back across the tightrope? No, Wallenda will be transported back. 5) How long will it take? It's booked for two hours on television. 6) How wide is the wire? Three quarters of inch. It's made by a Williamsport, Pennsylvania, company, and Wallenda has used the same rope on other walks, such as over the Grand Canyon in another Discovery Channel stunt a year ago that attracted 13 million viewers and produced 1.3 million Twitter tweets. 7) Would Windy City gusts possibly delay the walk? Lamaj says, "Up to 40 mph winds, they don’t expect a problem." 8) Will it be dark? Yes. Central Standard Time kicks in at 2 a.m. Sunday, setting clocks back an hour, meaning that Wallenda's walk, even if it steps off right at 6, will take place under conditions more like 7 p.m. this week. 9) Will a tightrope walk at that height set some kind of record? For the Wallendas, yes, but otherwise, no. Recall that Philippe Petit staged an unauthorized walk from one World Trade Center tower to the other in New York City in 1974. That was a shorter walk, but 1,368 feet off the ground. 10) The Wallendas have been doing this for years, so there's no real danger, right? Karl Wallenda, Nik's great-grandfather and the founder of the Flying Wallendas, died in 1978 at the age of 73 when he fell from a tightrope while walking between two buildings 121 feet off the ground in Puerto Rico. Misconnected support ropes and high winds were blamed. Video is posted on YouTube — not for the faint of heart. 11) Do I have to watch on TV, or can I experience it live? According to 42nd Ward Ald. Brendan Reilly, "Public viewing areas will be set up along Wacker Drive between Clark and Dearborn, with a second viewing area between Wabash and State." No tickets are needed. Police are expected to close Wacker Drive from State Street to Dearborn Street, including the State Street bridge and the Dearborn bridge. Other streets that might be closed include both State and Dearborn from Kinzie Street to the bridge and from Lake Street to Wacker Drive. There also will be no river access between State and Dearborn from 6 p.m. to 8 p.m. A map of the area with closures is found here.